One year after the debut full length The Voyager, Draugûl return with the sophomore full length, once again released under the banner of the great Pesttanz-roster. The review on the debut, by the way, was posted recently on the site; check the update on September 21st 2014. This one-man project by a guy from Malta (Hellcommander Vargblod, former member of Martyrium) now resides in Sweden, but I do not think this information is the most important right here. But now you’re up-to-date, aren’t you. Tales Of Loot And Plunder follows The Voyager in most aspects, with three non-ignorable aspects that do approve this sophomore release. An important difference, but not the sole, might be the lyrical theme, now mainly focused on Norse mythology and historical facts (with the mighty Viking-culture as basic), and not the Tolkien-literature anymore. This gets expressed in the performance too, as you will notice. The fifty-minutes+ album opens with Furore Normanorum II, a very impressive opening track that shows a great epic-laden Black Metal superiority, withholding the perfect balance in between power and melody. It’s a very varying track with different layers and exceptional excerpts (spoken words and Gregorian chants included; in fact, this song isn’t but a classic-in-spe!). And that brings me to the main difference: the song writing and performance. The Voyager was an album which I could enjoy a lot; especially the bathorian worship was (is) something I do appreciate. But the evolution in between both albums is just enormous. 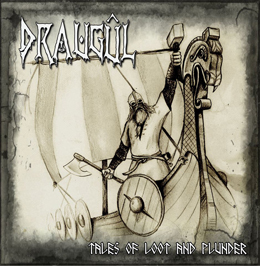 Still there is the great adoration / admiration for the (Scandinavian) Nineties scene, but Draugûl have perfected their own sound. That does not necessarily mean that it is better, but in this specific case, it is. An example is a track like Frán Sfärerna Av Asgard, which… Well, I want you to search it yourself. Or the hammerhearty epic Svoldr… But the general Viking / Black hymns themselves are of an extremely high quality, despite (or thanks to) the own approach! And a third important evolution, besides the poetic themes and the increased craftsmanship, is the production. This album too is recorded in Vargblod’s home studio (Minas Morgul Studio), but it sounds so much better! There’s less background noise, and the mix in between the individual players is much better balanced. Super to notice! Like on the former album, this one comes with guest vocals, female, once again by Katia Azzopardi, as well as Alexia Baldacchino and Vanja Obscure. The inspirations from Bathory and the likes are less pronounced this time; Draugûl have searched for, and created, their own identity (and it is a convinced one, as you might understand), yet not without totally denying this huge influence (one example to show: the riffs in Vengeance For Faith Renounced; you see, or better, you hear?). But once again the Commander of Hell comes with a cover track; this time it’s King Of A Stellar War by Greek Kult-act Rotting Christ. And believe me if I say that this one is just splendidly re-interpreted without denying the essential basics of the original composition.